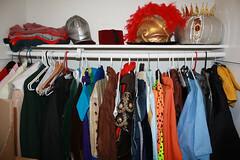 A costume closet fit for a king. Or clown. Or penguin. Or astronaut. Finally! The best part of this new apartment my wife and I have moved into – the closet space! Finally my costumes can all have their own homes on hangars! And there was still room for 6 regular shirts in the upper left hand corner!